KEAM 2018 Answer key Download – Kerala Engineering Medical Common Entrance Test 2018 For Physics, Chemistry on april 23rd and Mathematics exam on April 24th. Students can Download Answer key Solutions for Question papers A1, A2, A3, A4 and Cutoff Marks category wise from Below. Commissioner of Entrance Examinations (CEE) Kerala has conducted the KEAM examination 23rd and 24th April 2018. A huge number of hopefuls seeking admission Engineering, Medical, and Agriculture courses have appeared for the KEAM entrance test. The CEE Kerala has organized the Kerala Engineering Medical Agriculture Entrance test in many examination centres across the state. Lakhs of students seeking admissions in various graduate degree courses have appeared for the KEAM test with great grounding. All the hopefuls who have appeared for the KEAM examination 2018 can download KEAM answer key PDF to estimate the probable score in the examination. Candidates can download KEAM answer key from the CEE official website, cee-kerala.org and can compare the answers with the corresponding set to estimate the score. It gives the complete analysis of the question paper and the students can know how many questions they have correctly opted for the examination. The CEE will release the answer key for all sets A, B, C, D. Candidates can download the corresponding set for which the student has attempted in the examination and can analyse the score by tallying the answers provided in it. Every year, KEAM test conducted by the CEE (Commissioner of Entrance Examination) for the eligible candidates for giving admission in to various Under Graduation courses or programs such as MBBS, BHMS, BDS, BAMS, B.Sc (Forestry), BSMS, B.Sc (honors) agriculture, B.FSc, B.VSc (animal Husbandry) and B.Tech (in all branches) in the tops collges or the institutions of the Kerala state based on the merit or the rank they obtained in the exam and with the qualifying standards that are set by the CEE Kerala. Many of the hopefuls seeking to get admission in Kerala colleges clash for the KEAM entrance test. This year the KEAM Paper 1 [Physics & Chemistry] was held on 23rd April from 10 AM to 12.30 pm and the KEAM Paper 2 [Mathematics] was conducted on 24th April from 10 AM to 12.30 pm. The examination was organized in a large number of examination centres across Kerala. Candidates who have appeared for the KEAM admission test can download KEAM question paper solutions to compare the answers with the actual answers given in the official answer key. Candidates can download KEAM answer key PDF for all sets within 3 to 4 days after the examination. Keep visiting the CEE official website, cee-kerala.org to download the answer key. Commissioner of Examinations, Kerala is going to announce the KEAM cutoff marks 2018 shortly. Aspirants who have appeared the test have to score the minimum cutoff marks/qualifying marks to qualify the examination. Candidates scoring the minimum marks/qualifying marks will get admission in their interesting courses. The organization will announce the cutoff marks, results at a time. Approximately, the results and cutoff marks will be released after 3 to 4 weeks after the examination (tentatively). Competitors can keep checking the CEE official website, cee-kerala.org to check the latest updates from the authority. The admit card will be accessible @ cee-kerala.org. 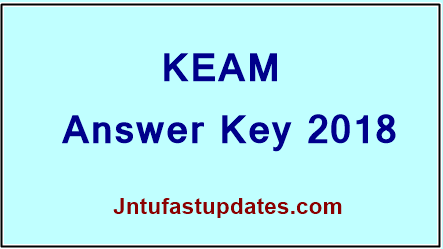 On the homepage of the website, students can find ‘KEAM Answer Key 2018’ link flashing. The KEAM Answer Key for all sets will be displayed on to the screen. Compare with the answer key and estimate the score.